The flu jab seems to almost halve the risk of heart attacks in middle aged people with narrowed arteries, finds research published in the journal Heart. Those aged 50 to 64 are not currently routinely included in national flu vaccination programmes in either the UK or Australia. But the findings prompt the Australian authors to suggest that further exploration of extending the schedule may be warranted. The researchers wanted to find out if flu is an unrecognised, but clinically important, contributing factor to increased heart attack risk. Published evidence suggests that flu boosts the risk of death from all causes as well as the risk of admission to hospital for cardiovascular and respiratory problems. They therefore assessed 559 patients over the age of 40 who were referred to a tertiary hospital during consecutive winters in 2008-10. Some 275 of these patients had sustained a heart attack and 284 had not. 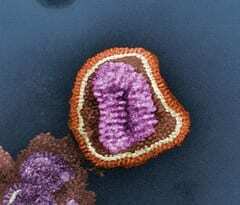 Nose and throat swabs and blood samples taken at admission and 4-6 weeks later showed that around one in eight (12.4%; 34) of the heart attack patients had recently had flu, compared with just under 7% (18) in the comparison group. Half of all the patients had had the flu jab that year. Flu had not been diagnosed in around one in 10 of those who had the infection, indicating that it may be missed in hospital patients with other clinical problems, say the authors. A recent respiratory infection was more common among those patients who’d had a heart attack and doubled the risk. But after taking account of other influential factors, such as age, high cholesterol, and smoking, flu did not increase heart attack risk. But vaccination against the infection did seem to be protective, decreasing the risk of a heart attack by 45%. Previous research suggests that infections such as flu might encourage blood to thicken or prompt an inflammatory response in arteries that are already diseased, so sparking the development of a blockage. Extending the flu vaccination programme to 50 to 64 year olds has been mooted before, but not considered to be cost effective, say the authors. However, cardiovascular disease, which causes a great deal of illness and death in older adults, wasn’t taken into consideration in these estimates, they add. “As such, even a small effect of influenza vaccination in preventing [heart attacks] may have significant population health gains,” they write. April 10, 2019 - People with stress disorders like PTSD are at higher risk of heart disease Science NewsThose coping with psychological trauma have a greater risk for cardiovascular disease, a large-scale study that goes beyond men and veterans finds. April 18, 2019 - Skipping breakfast and eating a late dinner could be a killer New York Post This meal plan practiced by many workers raises heart attack risk and early death. April 18, 2019 - Genetic test offers clues — and only clues — to a person's risk of obesity STATBuilt by a team of Harvard-affiliated researchers, the "polygenic risk score" appears to be more powerful than any past genetic test for obesity. April 10, 2019 - Gardening could reduce your risk of a heart attack, study finds TODAYA new study in the British Journal of Sports Medicine found that low-intensity activities like gardening can have major health benefits. Can your smart phone determine if you’re having the most serious – and deadly – form of heart attack?